Our 12th issue of For A Better World focuses on the apparel industry, a global industry with huge human and environmental costs. In an interview, Andrew Morgan tells us of his journey to directing the documentary The True Cost, about the impact of “fast fashion” on the people who make our clothes, and why the human story behind what we wear is so important. Safia Minney, founder and director of People Tree, offers an ethical fashion alternative. She tells her company’s quest to build a supply chain that is both just and sustainable while working with people in some of the world’s most marginalized communities. We also highlight some companies who are building alternative supply chains in the garment industry—and selling great looking clothes too. Are carbon credits a viable strategy in the fight to slow climate change? In the last issue, we posed that question to our readers and this issue features your responses. We also hear from two people who have been studying the issue: Dr. Kristen Lyons and Dr. Peter Westoby tell how one company exploited the carbon market and cheated local communities in Uganda. Their research shows the pitfalls of corporate, market-based approaches to confronting this crisis. Ryan Zinn follows up on a story of small-scale farmers in Latin America developing climate mitigation projects, and gives the possibility of a farmer-centered way forward. How do we keep small-scale farmers at the center of fair trade? We return to this question from several angles, showcasing some the work of IFOAM and the World Fair Trade Organization (WFTO) to develop guarantee systems that assure consumers of the ethics behind their goods while strengthening producer organizations and striving towards best practices for all. Mario Coscione of the Latin American and Caribbean Network of Fair Trade Small Producers (CLAC) tells us how their fair trade universities program is bringing together academics, students, and producer organizations as allies for fair trade and how they envision a network bringing about true transformation. Finally, we follow food justice activist LaDonna Redmond as she tells how one food cooperative is taking a broad perspective to increasing food access in a community of color. Through pressure from the community, they have transformed what appeared to be an unfair “done deal” into a model of how the food movement could tackle tough issues of racial and economic equity. Redmond challenges us all to think about what a truly just food system and economy looks like for all participants. 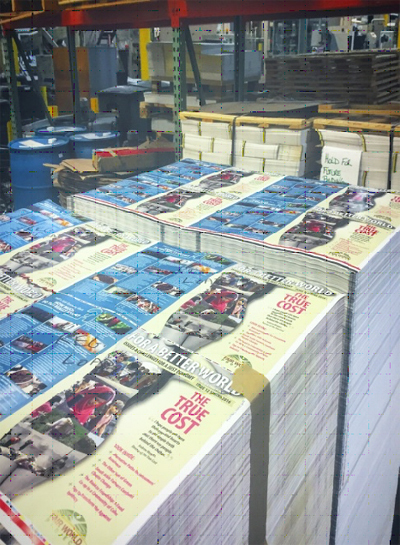 Find our For A Better World publication at your local fair trade store, natural food store, or co-op grocer, or at national natural food chains such as Whole Foods Markets. You can also read it online on our website, or sign up to join our distribution network to get a case to share with your community.